At least, I thought it was a jelly mould. But now, I’m not so sure. On the way to the supermarket this afternoon, we saw a small fleamarket (a word that never fails to get my attention) being held outside in aid of cancer research funding. A good cause and a fleamarket were enough to get us to stop and check it out. Amongst the goods on sale was a light brown mould of the dessert persuasion. 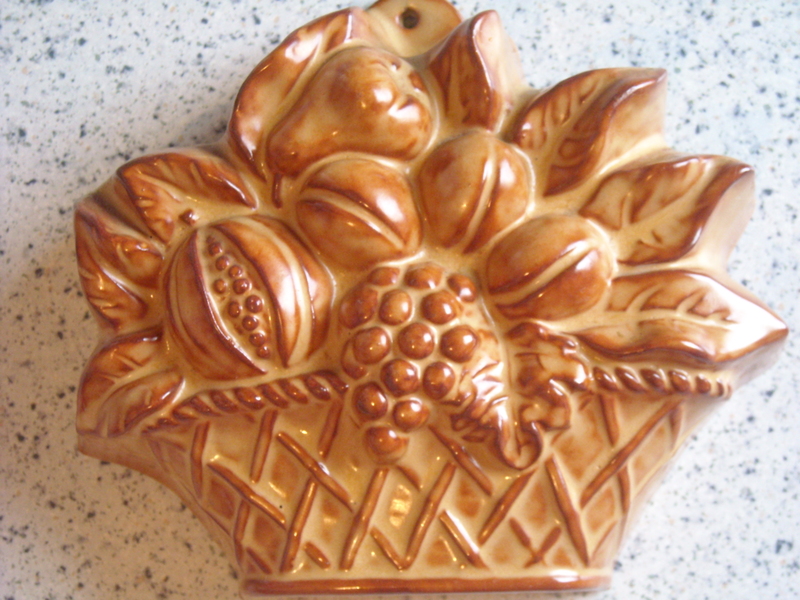 Or it could have been a wall decoration, given that there was a little screw-sized hole at the top. By the time I followed the instructions for Jelly Liqueur in Household Management later that day and popped the mix into the fridge, I really began to wonder. You never can tell sometimes. INGREDIENTS – 1 lb. of lump sugar, 2 oz. of isinglass, 1–1/2 pint of water, the juice of 2 lemons, 1/4 pint of liqueur. As a vegetarian, isinglass (dried fish bladder) and gelatine (derived from animal bones and skin) are not ingredients I like to work with. 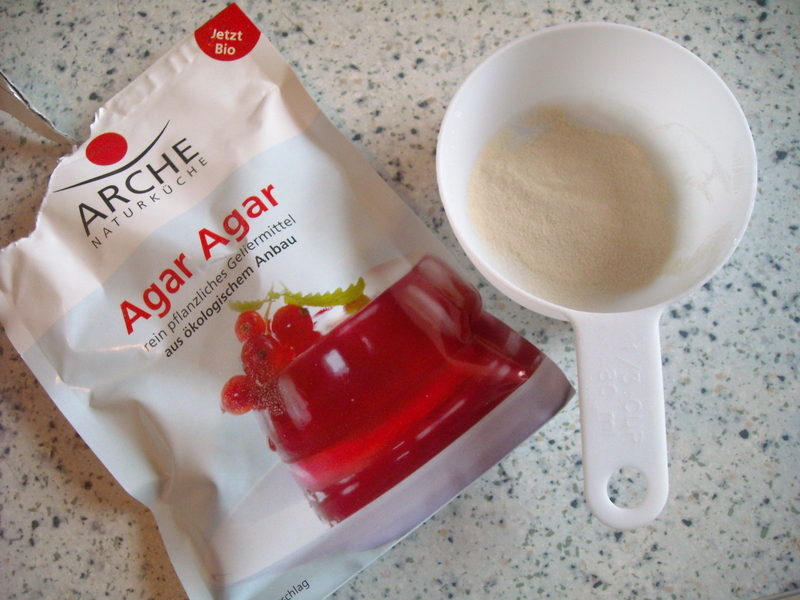 I don’t eat jelly very often anyway, but I did some enthusiastic research and found something called ‘agar agar’ in my local health food supermarket. It turns out that it’s a red algae derivative, popular in Asian cooking and perfect as a vegetarian alternative. 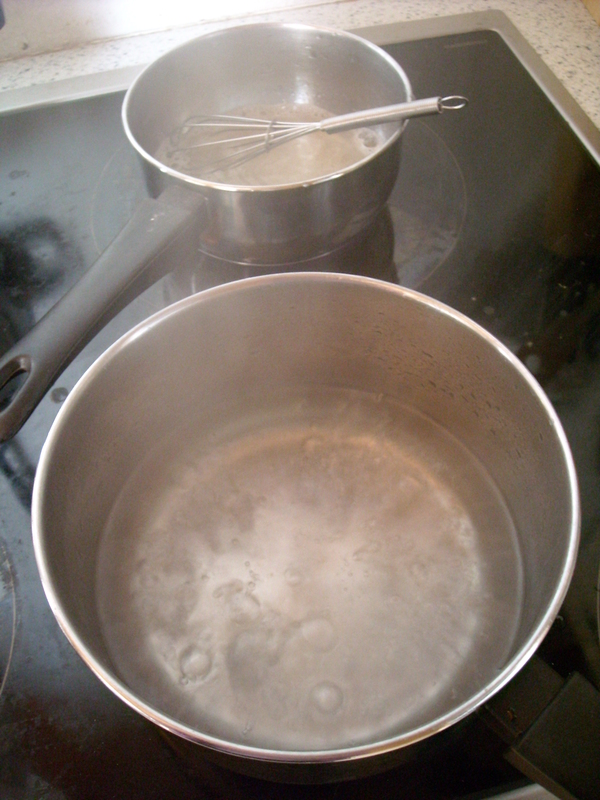 This jelly is made in two stages – first boiling the water and sugar together, with the agar agar and some more water in a second pan. Then, these are added together with lemon juice and a liqueur of your choice, and left to chill. 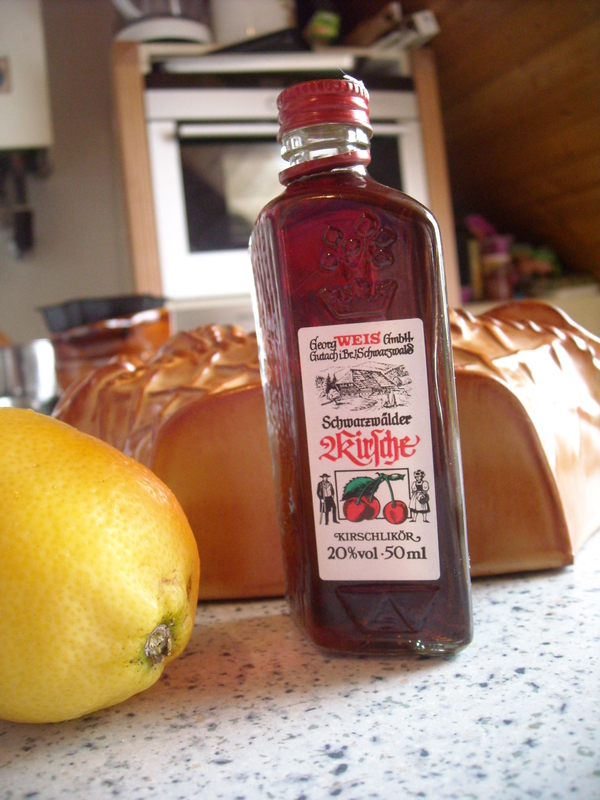 I don’t usually have liqueur (except for in delicious liqueur chocolates, of course), but on a recent trip to Freiberg im Breisgau (popularly labelled ‘the capital of the Black Forest’), I picked up a cute little bottle of cherry liqueur. I mixed it with a little of Mrs Beeton’s Lemon Brandy to make up the difference in quantity (see https://mrsbeetonin365days.wordpress.com/2010/02/03/day-69-lemon-brandy-part-1/) and https://mrsbeetonin365days.wordpress.com/2010/02/07/day-73-lemon-brandy-part-2/, and added it to the mix. As soon as I began pouring the hot liquid into the mould, ominous cracking sounds could be heard. I couldn’t see any damage to the mould itself, but I began to wonder if it really was what I thought it was. “Do you think it’s dangerous?” I asked my boyfriend, seeking a second opinion. Visions of jelly and sharp mould shards exploding all over the fridge raced through my head. “I’m sure it’s fine,” he called out confidently from the living room, where he was recovering from what I gather was a somewhat disappointing final episode of one of his favourite TV programmes. So I left it in the fridge to get on with its chilling. 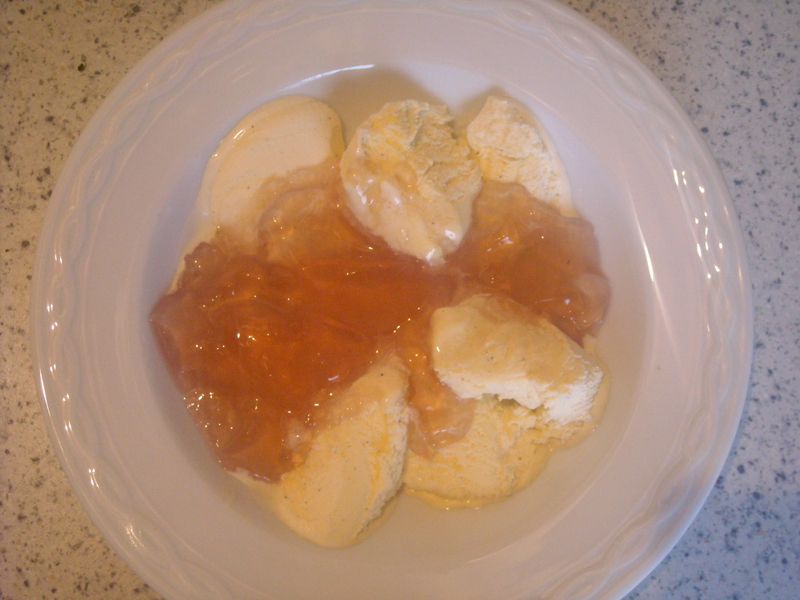 3 hours later, I began doling it out into two plates with a bit of vanilla ice-cream. I hadn’t used enough agar agar to make the jelly stiff enough to form a shape matching the mould’s form, but that didn’t really matter to us. For my first attempt, I was happy enough with the result. We both agreed that it was a bit on the sweet side, though. But that’s Mrs Beeton for you, I guess! I still don’t know if it’s a mould or a wall decoration. Life is full of mystery.